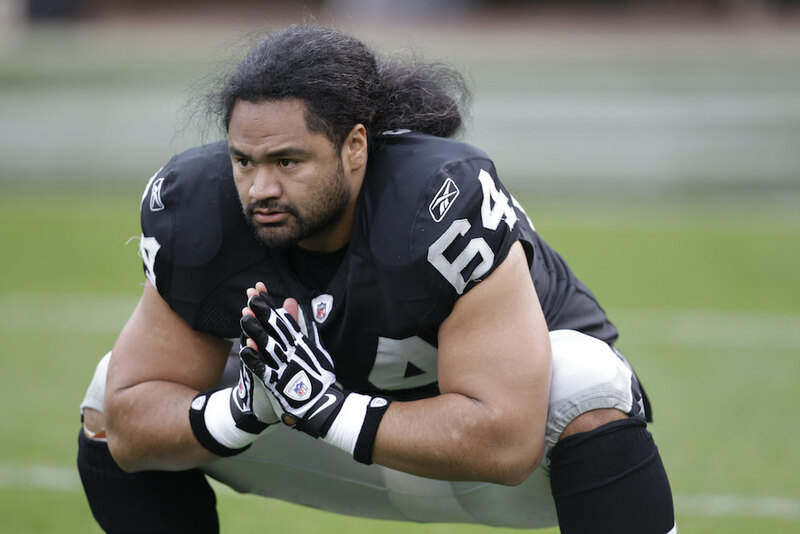 Former NFL center Samson Satele was born in Hawai‘i and played college football there. He’s one of a growing number of pro football players of Samoan descent. Photo by Ben Margot/Associated Press. This is a sports story that began with a sugar plantation and a Mormon temple. As the Kahuku Sugar Plantation fired up its boilers in 1890 and The Church of Jesus Christ of Latter-day Saints (LDS) built a temple in nearby La`ie in 1919, the area attracted an array of proletarian wayfarers, including Samoans, Tongans, and Mormons from Utah’s Great Basin. Driven by different agendas, plantation managers, and Mormon elders saw sport as a way to shape those they recruited to work and worship. These newcomers to the North Shore and their descendants embraced sport and built an ethos of their own. A few years after Silva retired, native son Famika Anae returned and became the first Samoan head coach at any level of the game. Famika was the son of a Mormon from Western Samoa who had answered the call to build the temple. Both Famika and his half-brother—that Samoan NFL pioneer Al Lolotai—were the products of La`ie’s tough blend of religion, fa`a Samoa culture, and football discipline. Famika’s father was initially skeptical of the game’s value. “Can you eat the football?” he asked. Famika eventually would have an answer when the game took him to Brigham Young University, where he played on an athletic scholarship. Famika returned to Kahuku in 1966, believing that excelling at the game was a way for local boys to go to college. For training and bonding, Famika took his Kahuku players to a nearby island, Lanai, which the Dole Company ran as a plantation. They picked pineapples for six weeks each summer and returned with money in their pockets, in shape to play. He knew how much that money meant to boys whose families lived so humbly. Over the decades, Kahuku has developed hundreds of collegiate and pro players, including winners of several Super Bowl rings. Sport meant battle and players readied themselves for games by performing the siva tau, a war dance. Their younger fans made Kamehameha Highway, the only way out of town, a gauntlet for opposing teams, pelting buses with gravel and coral stones from the shadows. In the 1990s, Kahuku often reached the championship but repeatedly lost to Honolulu’s Saint Louis School. To be crowned king of Hawaiian football, the school had to dethrone Saint Louis and its legendary coach Cal Lee, which had dominated state football for two decades. In 2000, Kahuku was coached by Sivaki Livai, who had played for the school after migrating from Tonga. Thousands traveled to Honolulu for Kahuku’s championship game with Saint Louis. After Kahuku delivered a historic victory, a caravan of buses, cars, and pickups snaked its way northward past cheering crowds gathered along the black-topped road. The buses stopped in each town so that players could perform a siva tau. Arriving home after midnight, they were greeted by supporters basking in a sense of fulfillment. Since 2000, Kahuku football has maintained an almost unrivaled level of excellence. It’s become the story that many tell about their town to the world, a story about people who work hard and play harder, who lose but persevere, and in the end are heralded for their accomplishments. The flow of boys to college football has not slackened and many use football to gain an education and launch careers in and out of sport. “I don’t think there’s a high school program in the United States that has benefited more from sport than Kahuku,” Dr. Allen Anae, son of the former Kahuku coach Famika Anae, argues. Eighty percent of its current student body participates in interscholastic sports. “Now we have parents thinking, if I support my kids’ football—and not only football but women’s sports—they can get a college education,” Anae observed. Maybe you can eat that football after all. Rob Ruck is a professor of history at the University of Pittsburgh and author of Tropic of Football: The Long and Perilous Journey of Samoans to the NFL.